The Storage Made Easy Google Chrome DashBoard is a Chrome extension that enables you to manage multiple cloud providers from one single web window. It offers all the functionality of Storage Made Easy in a single web page for the Chrome Browser. 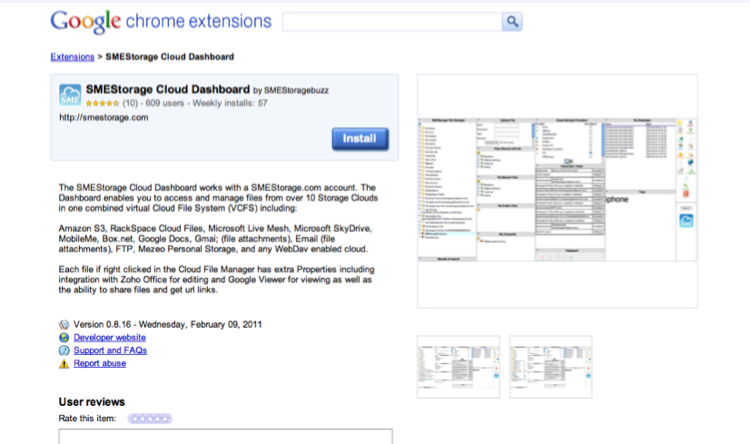 You can obtain the Storage Made Easy Chrome extension from the Google Chrome Extension marketplace. Once you download the extension you will be asked to install, and after you will have a Storage Made Easy icon on your Chrome taskbar. If you click the Storage Made Easy extension on your Chrome taskbar you will be taken to a login page. Here you can enter your Storage Made Easy username and password. 1. You can move the windows around by clicking dragging where the windows meet each other. If you have windows you don't require or use very often, collapse them. 2. The Virtual Cloud File Manager is on the left. You can access files by clicking on directories to view them and then right click to perform actions on them, including launching office editors and viewers etc. 3. You can also drag and drop to move files, even between clouds ! 4. You can easily upload multiple files by dragging files onto the multiple file upload area, or alternatively you can upload single files and tag them. 5. You can create new files and folders, or upload files by URL, and numerous other actions from the action bar on the right hand side of the DashBoard. 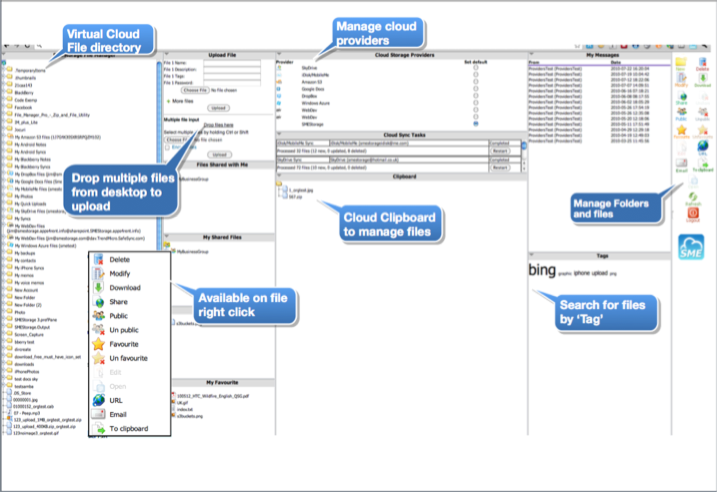 7, You can use the Cloud ClipBoard to 'stash; files you want frequent access to and you can also choose to share these files by url in managed file sharing email. 8. If you tag files, then clicking on the Tag will show you the files related to the Tag.